PRINTING FROM MOBILE DEVICES AND CLOUD-BASED SERVICES A range of software and MEAP-based solutions are available to provide printing from mobile devices or Internet connected devices and cloud-based services depending on your requirements. 2a Time from device power-on to when copy jobs can be programmed with Quick Start Up mode. 2b Time from exiting Sleep mode to when printing is operational. 2c Time from device power-on to when key operation can be performed on the touch screen.3 Includes main unit and either Cassette Feeding Unit-AM1, High Capacity Cassette Feeding Unit-A1, or Cabinet Type-N. The imageRUNNER ADVANCE C5550i III device from Canon is designed to deliver seamless digital business communications with enterprise-level functionality. This multifunction color printer can fulfill present-day workflow demands and add scalability for future business needs. Incorporating the third generation Canon imageRUNNER ADVANCE value pillars, the imageRUNNER ADVANCE C5550i III model is built on an intelligent information management platform that comprises: Workflow Efficiency, Cost Management, Security, Device and Fleet Management Efficiency, Quality and Reliability, and Sustainability. Canon’s imageRUNNER ADVANCE Series of multifunction printers is designed to help meet complex printing and scanning needs including outstanding color and fast print speeds. The versatile imageRUNNER ADVANCE C5550i III device is suited to meet business requirements for high productivity with its intuitive usability, sophisticated authentication features, remarkable speed, and amazing color output. Designed for a seamless workflow, the multifunction imageRUNNER ADVANCE C5550i III model is capable of print speeds at up to 50 ppm on letter-sized paper, with a 150-sheet single pass duplex feeder. It also offers two-sided scanning in a single feed, resulting in speeds as fast as 160 ipm. 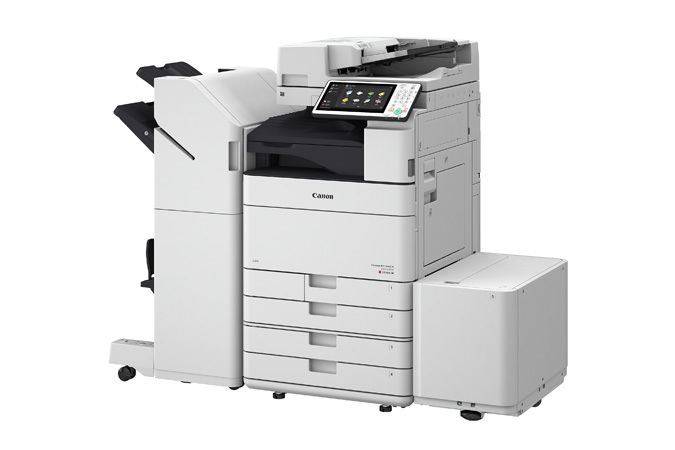 Expect a copy, print and scan experience that supports flexible paper handling and finishing capabilities to meet the varied needs of diverse office environments and workgroups.